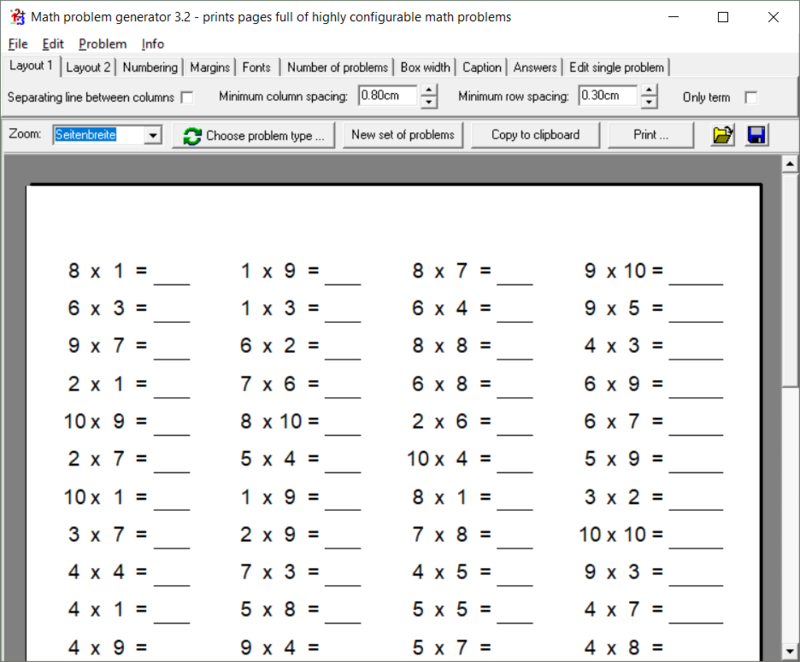 Are you a math teacher looking for exercise sheets which exactly match your students' current skills? Are you a parent practicing basic arithmetic operations (+, -, *, /) with your children? 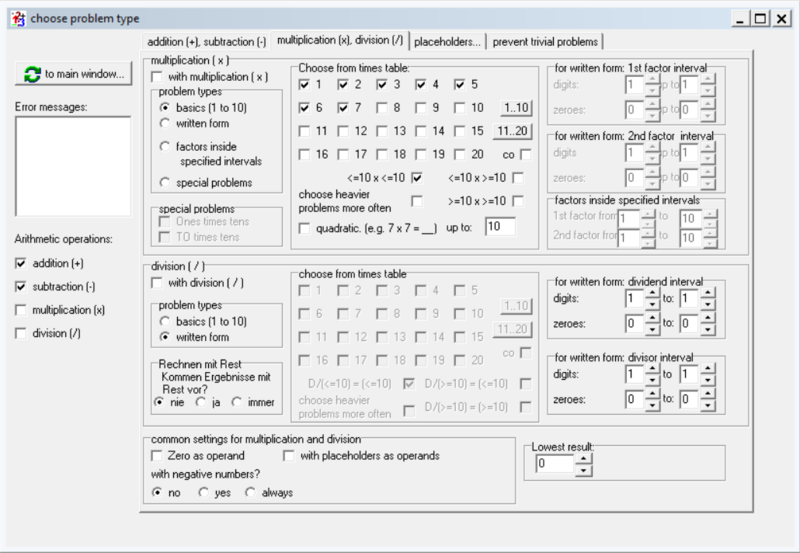 Creating sheets full of math problems specific for individual students is a tedious task which is made easier by this freeware math problem generator. export to clipboard and insert e.g. in Microsoft Word → ideal for creating test papers and individual worksheets! You can run this program without installation. Just download the zip-file below, unpack it and start the executable file inside. This software is freeware. You may use it without paying for it. Publication, e.g. on CD, only with permission by the author. The main window (see picture on the right) consists of a menu bar (File, Edit, …), a tabbed pane with layout options, an action bar and the preview of the current exercise sheet. 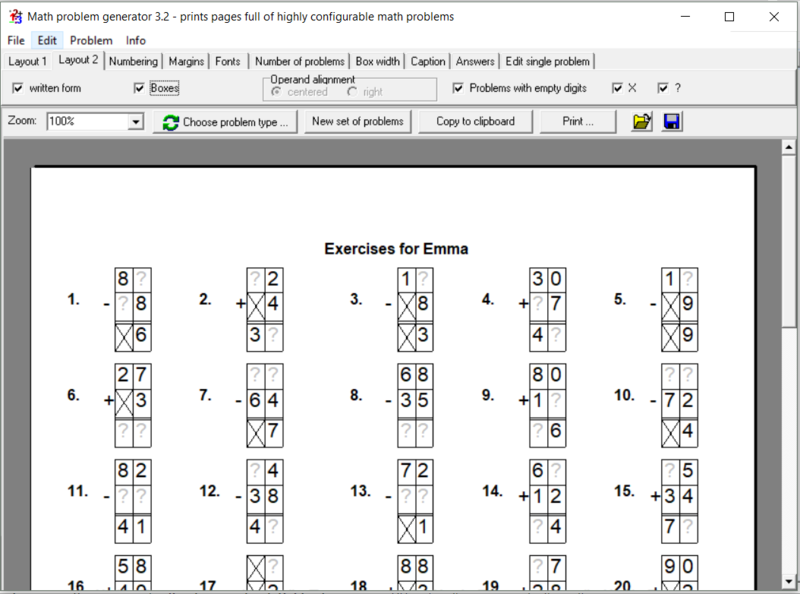 In the file menu there are options to open existing exercise sheet configurations, save them and print exercise sheets (optional: several different sheets with extra solution sheets). Save default settings stores the current configuration in a file which is read on every program startup. The edit menu only consists of one item “copy” which copies the content of the current exercise sheet as vector graphic to the clipboard. From there you can paste it into any text program (e.g. Microsoft word) or graphics program. 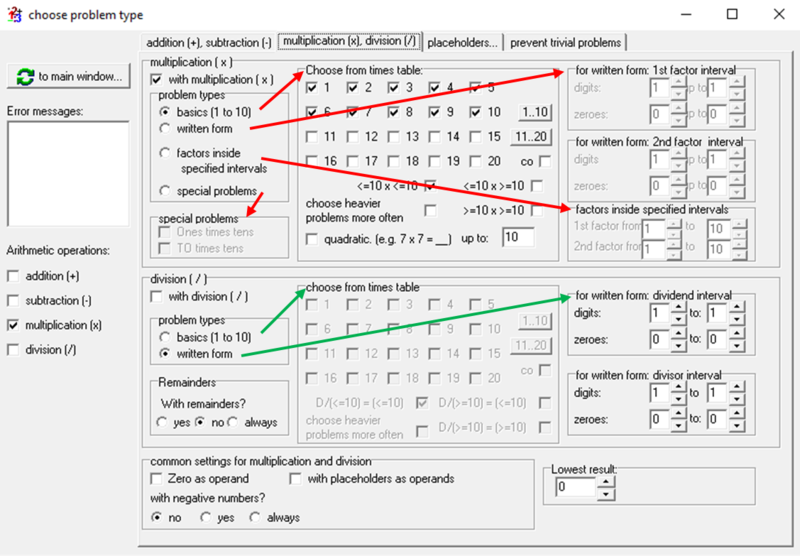 The problem menu consists of menu items to choose the problem type and to find new problems, that is: discard all problems on the current exercise sheet and find new ones based on the current problem type configuration. You get this window by clicking on the button . Most options are self explanatory. Just place the window next to the main window, try out the options and watch the preview in the main window instantly change accordingly. count over ten means that the “ten-digit” of the answer is not equal to the “ten-digit” of the first operand. For example 17 + 8 = 25 is with count over ten, '17 + 2 = 19'' is without count over ten. count over hundred is like count over ten, but for the “hundred-digit”. “TO” means a number with only “one-digit” and “ten-digit” set (e.g. 17). “H” (“hundred-digit”), “T” (“thousand-digit”) is used in analogy. Keep in mind section “arithmetic operation” on the righthand side. Here you can select which operations are used in the exercise sheet. 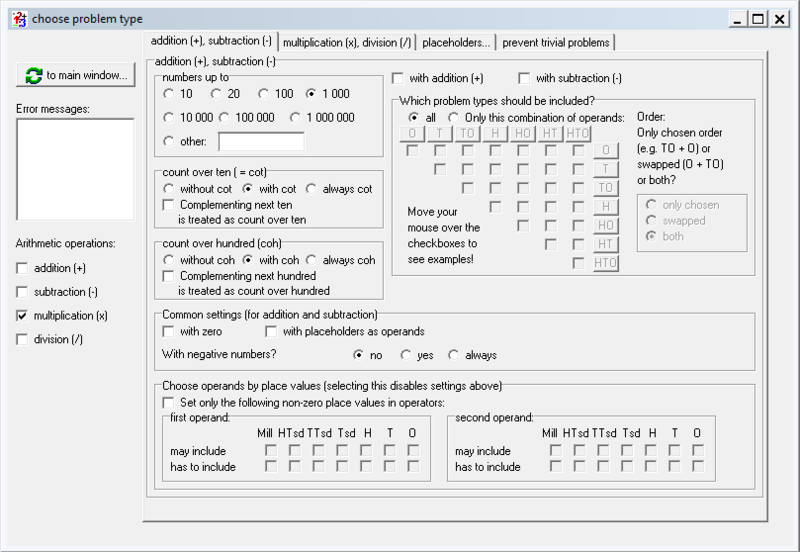 If more than one operation is selected they are mixed with equal probability. Like with “addition, subtraction” most options are self explanatory. Just try them out and watch the changes being reflected in the preview. 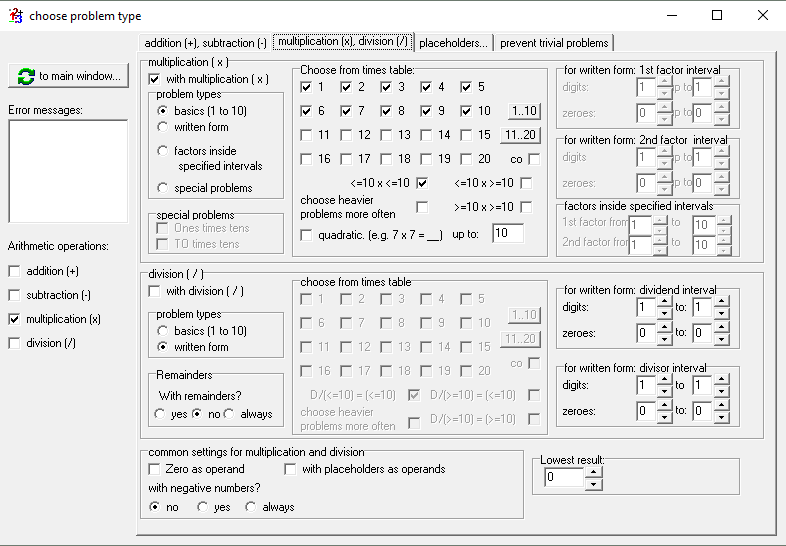 You can choose from several “problem types”. These correspond to the sections on the righthand side. 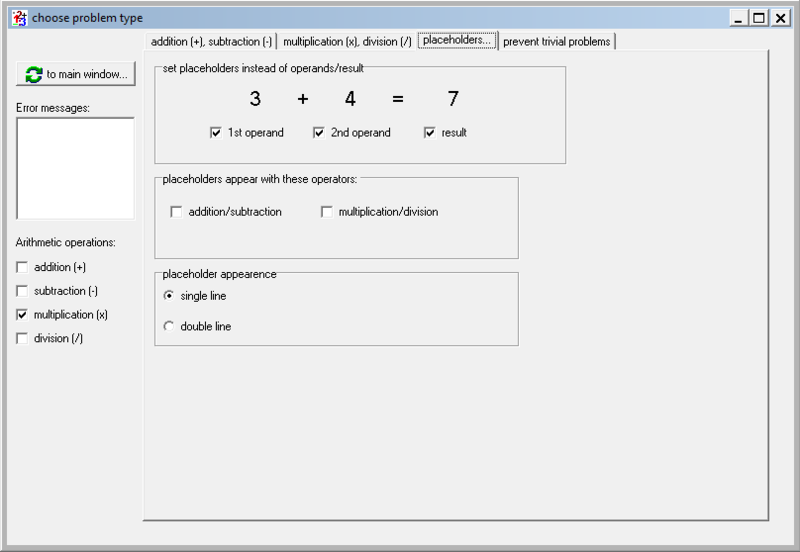 Here you can determine the possible placeholder positions and the appearance of placeholders. After introductory lessons you probably don't want trivial problems to appear on exercise sheets. 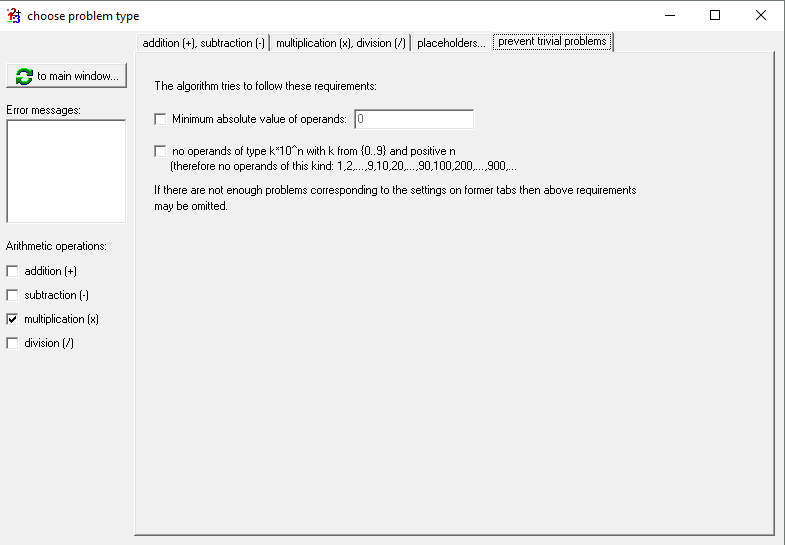 If you want to generate a block of math problems in order to paste them into another program you can set the preferred number of problems here. Here you can set the placeholder size. You can also edit the caption by clicking at the top of the page in the preview.